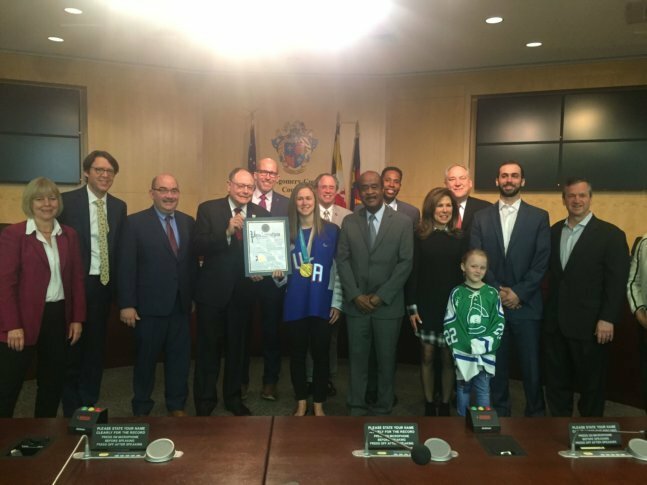 Haley Skarupa, a member of the gold medal-winning U.S. women's Olympic hockey team and a Rockville native, was congratulated by the Montgomery County Council on Tuesday in Rockville, Maryland. See photos. WASHINGTON — Haley Skarupa, a member of the gold medal-winning U.S. women’s Olympic hockey team, was congratulated by the Montgomery County Council Tuesday in Rockville, Maryland. Skarupa and her teammates won the gold medal at the 2018 Winter Olympics. It was the first gold medal win for the U.S. women’s Olympic hockey team in 20 years. Skarupa is a native of Rockville, Maryland, where she started playing hockey. She graduated from Wootton High School. Councilmember Sidney Katz and County Executive Isiah Leggett presented Skarupa with a proclamation recognizing her achievements. “We are proud of Haley for representing Montgomery County and the entire country on the world stage,” said Councilman Katz. WTOP’s Melissa Howell contributed to this report from Rockville, Maryland.